A debate has been going on for years about which method of activity-based costing (ABC) is better to use for assigning costs: Time-Driven or Driver Rate-Based. The answer: It depends on the circumstances. There’s a great deal of confusion regarding which one to use and around terms such as “push” vs. “pull” and “top-down” vs. “bottom-up” in which the latter perspective of both terms is one where a product isn’t consuming all of the supplied capacity expenses, and the former perspective is one where the capacity expense, including unused or idle capacity, is being fully traced into the product, thus overcosting products. This raises several questions: How are the approaches similar? How are they different? Is one method superior to the other? Can a company start with the former method and transition to the latter method as informational needs increase? What are the conditions when one or the other method might suffice? To discuss the merits, we need a starting point to establish clarification. It’s an incorrect simplification to refer to Time-Driven ABC (TDABC) as the “pull” basis and its predecessor, the conventional Driver Rate-Based ABC (DRBABC), as the “push” approach. The decisions to use the push vs. pull or Time-Driven vs. Driver Rate-Based method are independent of each other, so their merits should be evaluated independently. Figure 1 displays a two-by-two matrix where either method can be used with either a push or pull approach. 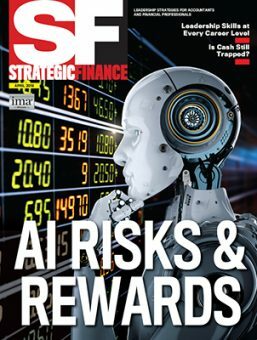 Before contrasting and debating these two methods, we want to emphasize that both types of ABC methods described in this article are vastly superior to the common and misleading practice of allocating indirect and shared expenses (i.e., overhead) using a single “cost pool” and its associated “cost allocation factor.” Such a practice violates costing’s “causality principle,” which is “the relation between a managerial objective’s quantitative output and the input quantities consumed if the output is to be achieved.” (See “The Conceptual Framework for Managerial Costing” by Larry R. White and B. Douglas Clinton at www.imanet.org/MCCF.) Simple cost allocation factors (e.g., number of input labor/machine minutes, units produced, units sold, full-time equivalent employees, and square feet) don’t reflect a proportional relationship of the product cost and the work activity costs it consumes. 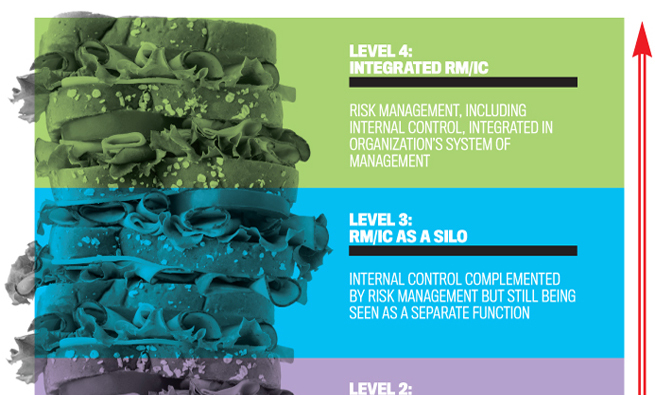 Using simplistic factors is often referred to as “peanut butter spreading” with broad noncausal relationship averages that result in inaccurate costs. Before diving deeper, we want to make a comment about expenses and costs. We view them as different things. Expenses are defined as when an organization exchanges money with third parties, such as paying suppliers or paying employees’ salaries. An expense is synonymous with “spending” to acquire resources. Examples of resource expenses are salaries, supplies, electrical power, or purchased components. (Expenses may also be “near-cash” to reflect the obligation to pay cash in the near future.) In short, with expenses, currency exits the treasury bank account. In contrast, costs reflect the consumption of the spending of the expenses. They are always “calculated” using modeling, and modeling translates expenses into costs. 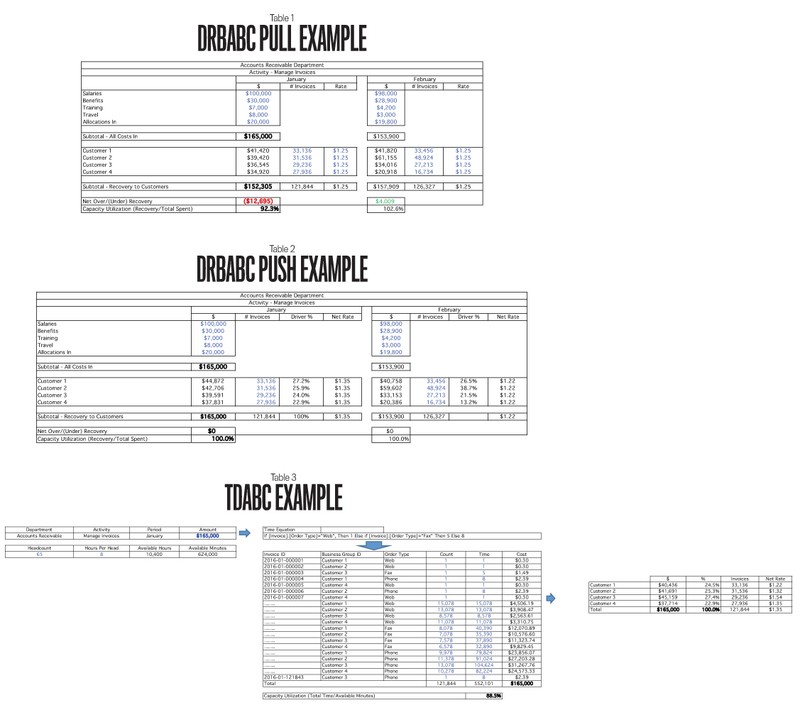 For the “Absorption Type” rows in Figure 1, the terms push vs. pull refer to whether all of the expenses incurred are fully allocated (pushed) to products as product costs or whether only a measurement of the consumed amount of those expenses is pulled into the products. For the “Assignment Method” columns, the terms Time-Driven vs. Driver Rate-Based represent a unit of method cost assignment difference: time vs. quantities. We want to make it clear that either assignment method can be used with either absorption type. This article describes both the Time-Driven and the Driver Rate-Based methods and the push vs. pull approaches and their respective merits. It also describes the conditions where a Time-Driven cost assignment method provides superior information compared to the Driver Rate-Based method. A push approach to costing means full absorption in which 100% of the expenses incurred during a time period are assigned to the activities performed, and all of those activity costs are in turn reassigned to the recipients or “cost objects” that consume them. All expenses are accounted for in which the expenses collected in the General Ledger (GL) accounting system (primarily from payments for purchases, employee payroll, and accrual-type journal entries like depreciation) equal the total amount when adding up all of the activity costs and the ultimate final cost object costs. Examples of final cost objects are products, standard service lines, types of orders (e.g., special vs. standard or domestic vs. international), channels, customers, and business-sustaining cost objects. Other more advanced examples of final cost objects can include individual orders and order lines, shipments, deliveries, medical patient encounters (such as a visit to the doctor), or any other type of individual customer-related transactions. Business-sustaining cost objects are those that aren’t related to making products, distributing them, or serving customers. Some people may consider them cost assignments from support departments (e.g., legal expenses) and not include them with the other final cost objects just mentioned. The push approach proportionately traces costs based on consumption relationships and is like a complete electrical circuit from the provider to the receiver. The benefit of this approach is that there’s a 100% complete reconciliation of the expenses to the officially reported financial results in total. Therefore, the cost amounts are credible overall and reasonably accurate. With the push approach, estimates of driver quantities are acceptable since each assignment must normalize to 100%. A downside of the push approach is that the supplier of the resource capacity expenses (i.e., the “sending” spender of expenses) always recovers 100% of its incurred expenses. Therefore, if a support group such as information technology (IT) or Finance spends more than its budget, it becomes the receiving internal department’s problem, not theirs. This doesn’t provide an incentive to the support group to reduce its expenses. For example, if resources were added or paid overtime by IT or Finance to meet deadlines or performance measures, those receiving the allocation would bear the cost impact, no matter whose behavior caused the variance. Another negative aspect of the push approach is that it is frequently capacity insensitive. That is, there’s no obvious way to differentiate and classify individual resource capacities as used or unused (e.g., idle or excess). Hence, the final cost objects will be modestly overcosted for expenses that they didn’t cause or require. 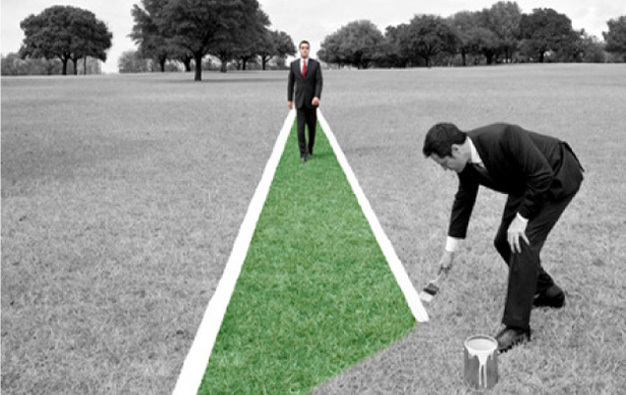 As a result of the shortcomings of the push approach, the pull approach was born. Think of it as a partial absorption of the resources’ expenses. With the pull approach, senders of expenses can be viewed as mini profit centers in which agreed-upon rates for their services are established, typically based on a budget of planned expenses and expected volumes. Consumers of these services pay a fixed rate (i.e., price) for the actual volume that they consume—no more, no less. The pull approach opens a new world of arm’s-length relationships between supporting centers and customer-facing departments. Customers, whether they are internal or external, often prefer this arrangement because it allows them to have some control over how much expense from their organization is planned for them as costs. 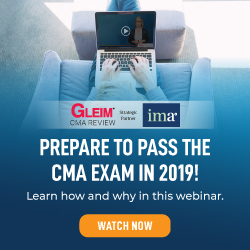 Additionally, internal service providers may favor this method because it can show the value of their services or the need for additional resources based on the overrecovery or underrecovery of their costs charged to their customers. For example, if an IT group were shown to be overrecovering its costs via these chargeouts by a large margin, this information could be used as justification for increased headcount or at least demonstrate that they are performing highly. The pull approach also introduces a rudimentary measure of capacity utilization: the percent over/under cost recovery. But a problem with the pull approach is that the correctness of the cost assignment is highly contingent on setting accurate rates. Imagine a cost assignment network that includes cross-charging in which estimated rates are applied. There would be multiple overrecoveries and underrecoveries of expenses, potentially large ones, because of faulty rates. The result would be a difference from the actual GL expense totals in aggregate, thereby questioning the overall credibility and understanding of the costs. 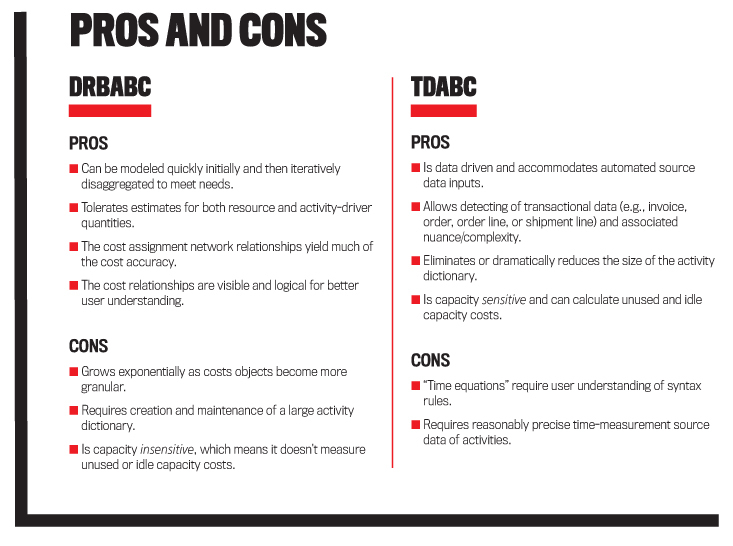 Regardless of the previously referenced advantages and disadvantages of the push- vs. pull-based costing approaches, there lies a separate decision as to whether to use TDABC or use the conventional DRBABC assignments. Both methods can be used with either a push or pull approach. To see how, consider the following examples. Pull Approach. An Accounts Receivable (A/R) department could establish an activity cost driver that is a predefined rate, such as $1.25 per invoice, based on its budget and volume projections, and charge for its services on that basis. At the end of the year, the A/R department will be overrecovered or underrecovered because their actual incurred expenses and the volume consumed will never match the projection exactly, no matter how skilled an organization is at budgeting. In this example, the pull approach’s driver is the quantity-based number of invoices rather than a standard time to process each invoice. You can see a shortcoming of the pull approach in Table 1. While a form of capacity utilization value is an output from this approach, there’s a financial underrecovery in January and an overrecovery in February. The total amount spent in January was $165,000, but only $152,305 was charged to customers. In February, $157,909 was charged, but only $153,900 was spent. These differences would eventually need to be reconciled somehow at some point. Push Approach. Alternatively, the DRBABC method could be used with a push approach in which all of the A/R department expenses are charged to customers. No over-recovery or underrecovery reconciliation would be required. See Table 2 in which all of the expenses are charged as costs based on number of invoices, resulting in a net calculated rate each month. In this case, all of the $165,000 January expenses and all of the $153,900 February expenses are charged to customers, thereby resolving the financial variance problem. Yet note that the capacity utilization is always 100%. The cost rate was different in each month, and there’s no measure of the efficiency of the department. TDABC is a model of supply and demand for cost and capacity that leverages estimated unit times, not unit quantities. It solves some of the challenges in DRBABC because it can provide both a full assignment of the expenses as costs and a meaningful capacity utilization measure. Consider that the same A/R department could utilize a time-driven assignment method that’s dependent on the unit times to process the various types of invoices, which means the time will differ whether the invoices were received via Web, fax, or phone. These time-based variables are captured in a formula that calculates the amount of time taken to process each invoice. With TDABC, the total time is calculated based on rendering the time equation on every invoice. The actual A/R department dollars then get charged to each invoice based on an individual invoice’s processing time relative to the total processing time of all invoices. (See Time-Driven Activity-Based Costing by Robert S. Kaplan and Steven R. Anderson, p. 36, for more details on this technique for the cost calculations.) This is time-driven because it uses a time algorithm applied to each transaction and push because all the expenses are accounted for. TDABC’s time algorithms are also referred to as time equations. With TDABC, the costs are calculated at the invoice level of detail, not at the aggregated customer level (see Table 3). The time equation is applied at that more granular level, and the total amount allocated matches the incurred expenses, i.e., the same $165,000 in January as seen previously. The total invoice count matches the total in the conventional DRBABC example, but in this case all of the dollars were pushed and a calculated time was the basis for the assignment. It’s important to realize that the time calculation was based on the input of standard unit times for the different order types, not actual times clocked or estimated times surveyed. When the values for January are aggregated by customer, the summed amounts for each customer are different than they were for the DRBABC approach because the time-driven approach captures more variation and diversity of cost objects. Customer 3’s low use of Web and high use of phone increased its cost and provided insight that wouldn’t be found using the single-driver case. The DRBABC method can address this by further disaggregating the activity into more granular ones. But this introduces the issue of how granular and detailed the DRBABC model and its associated data collection of activity driver quantities should be designed. We discuss this issue later in the article. In defense of the DRBABC approach, the “variation and diversity” captured by the TDABC approach in the previous A/R department example could also have been detected and captured with DRBABC’s push approach through some additional work. As described earlier, this would have required “disaggregating” (i.e., decomposing the A/R department’s activity dictionary into more granular activities). It will also require estimates from one or more employees in the A/R department for the increased number of resource assignments to calculate the activity costs. (An activity dictionary is a list of activities by function, department, and business process that managers can use to help determine key metrics and find ways to improve operations.) For example, the original activity “process invoices” would be subdivided into “process invoices by the Web” and “process invoices by phone.” Each customer A to D would then be charged based on the number of types of processed invoices (i.e., the activity cost driver). 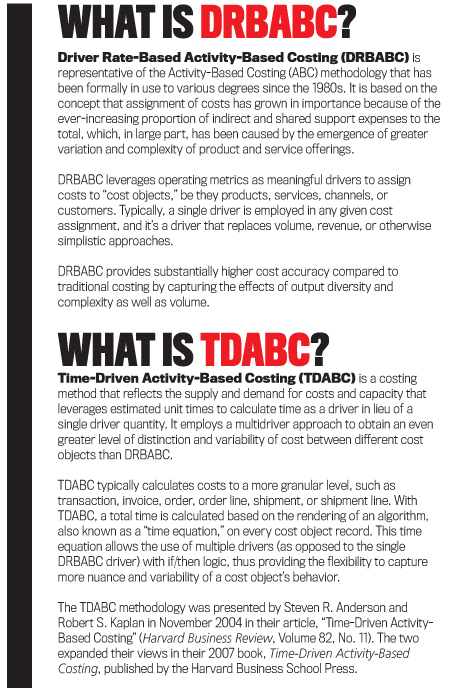 The level of disaggregation of activities defined with a DRBABC model to match desired cost accuracy requirements begins to provide some insights as to how and why TDABC is different from DRBABC. Increasing disaggregation requires both an increased number of resource expense assignments to the activity costs and, similarly, an increased number of activity cost-driver assignments to the final cost objects. The DRBABC model becomes more complex. The administrative effort to collect the data (i.e., via employee estimates or from source transactions), calculate the data, validate it as information, and report it will expand substantially. WHEN IS TDABC MORE USEFUL THAN DRBABC? The domain of DRBABC is characterized by not having substantial diversity of and variation in its final cost objects and a limited number of consuming types of final cost objects by the “final-final” cost object. A “final-final” cost object consumes other final cost objects. A prominent example is a customer consumes products and types of channels that already consumed their related activity costs. A DRBABC cost model is activity-centric. The domain of TDABC has opposite conditions. It is characterized by substantial diversity of and variation in its final cost objects, potentially more types of final cost objects consumed by the “final-final” cost object (typically a transaction or order line), and multiple skill types of employees working on a single activity. 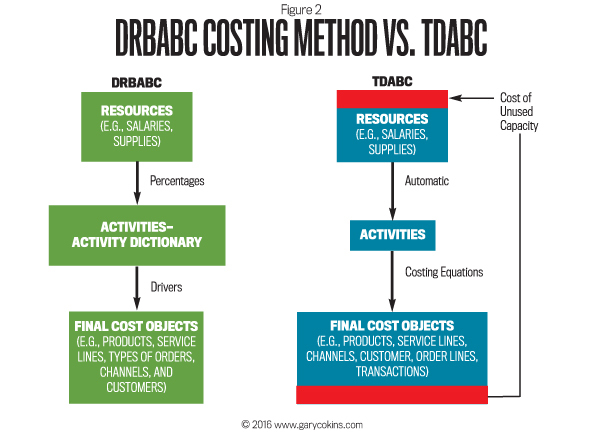 A TDABC model is final-cost-object-centric. There’s also a crossover point where TDABC becomes more useful than DRBABC. In the DRBABC cost model, the level of cost accuracy of the final cost objects comes primarily from the activity costs—each with a unique consumption relationship with a subset of the final cost objects—and their associated quantities of the activity driver to that subset. The crossover point is located where TDABC has relatively greater utility than DRBABC. At that point, the activity dictionary of the activity-centric DRBABC model is basically jettisoned and replaced with a final-cost-object-centric TDABC model powered by equations and algorithms. TDABC doesn’t make use of activities as DRBABC does. With TDABC, there is little or no activity dictionary and the associated activity cost pools. And activities no longer represent a large intermediary stage for the assignment of resource expenses to the final cost objects. The TDABC equations take over and perform the heavy lifting that’s accomplished in the DRBABC model with its activity dictionary. So when does the crossover point occur? DRBABC models allow for a quick start and for the use of estimated activity percentages applied to relatively small numbers of cost objects. Managers typically can provide percentage or unit quantity estimates to apply to products and customers that number no more than in the hundreds. As further disaggregation is needed, at some point the maintenance and accuracy of a DRBABC model becomes stretched. The activity dictionary grows and becomes more burdensome to maintain. At that point, the substitution of TDABC, with its more data-driven approach and more transactional-level cost object instances, becomes more suitable to the task and easier to maintain. 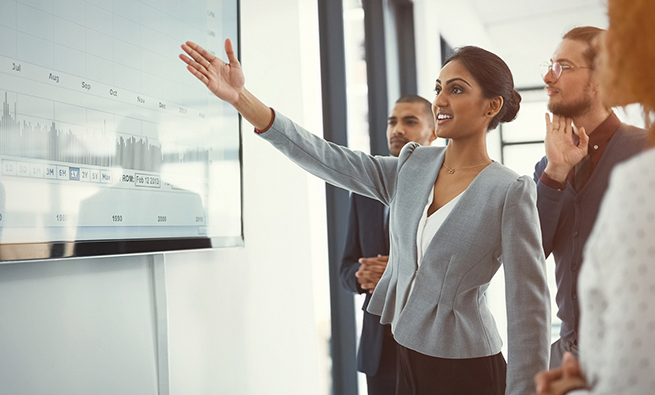 Organizations may not have all the desirable driver data from their enterprise resource planning (ERP) systems for the time algorithms, but this becomes less of a problem as software automation continues to improve. The added bonus is that TDABC provides visibility to capacity utilization information while still providing full absorption of actual cost. Figure 2 contrasts DRBABC with TDABC. DRBABC is a push approach that is capacity insensitive. That is, any unused capacity expenses won’t be recognized, which results in all activity costs and final cost objects being modestly overcosted. TDABC on the other hand, is capacity sensitive and provides capacity utilization information using the time-based methods described previously. TDABC doesn’t rely on detailed activity cost pools from which to allocate as DRBABC does. The “heavy lifting” of TDABC is done in the final cost object module using standard times for executing a transaction multiplied by the cost. The factors in TDABC’s equations can be quite numerous depending on the combination of unique resources (with different cost rates) and the variable amounts of time required for a single unit of a transaction. The equation reads each invoice from the company’s source system. If it is type Web, the unit time is one minute. If it is a Fax order, then the unit time is five minutes. Otherwise, if it is neither of those two, then the unit time is eight minutes. These unit times then can be multiplied by some other driver. In this case, it was simply the invoice count of one. TDABC is capacity sensitive. Capacity utilization can be measured in cost terms. In contrast, DRBABC is capacity insensitive. Any unused capacity is included with the activity costs, thus overcosting the final cost objects. With DRBABC, however, unused capacity can be measured for some resources (e.g., equipment) and estimated for people-centered resources. For the latter, the estimated unused capacity expense can be assigned a “business sustaining” final cost object. This reduces the overcosting issue with DRBABC. But before we conclude that this TDABC feature of determining capacity costs automatically makes it the superior choice over DRBABC in all cases, we need to assess to what degree idle and excess capacity is a relevant concern relative to the value of having directionally accurate product, channel, and customer profit margin information. As previously mentioned, whether a company selects TDABC or DRBABC, the shared goal of both methods is to move away from the single cost pool allocation factors that violate costing’s causality principle. TDABC has advantages with respect to level of detail, cost accuracy, automation, and capacity calculation. But it also relies on capturing unit times or other equation inputs for major business processes. In many organizations, these simply aren’t available at the onset of the initiative. DRBABC has an advantage by enabling a quick start to getting meaningful insight into costs and profitability. Smaller activity lists and fewer numbers of final cost objects that can be aggregated (e.g., product families, types of customers) can be modeled quickly. Estimates from knowledgeable cross-functional employees can be used initially and iteratively be replaced with source data as needed. As mentioned earlier, push cost assignments always normalize to 100%. 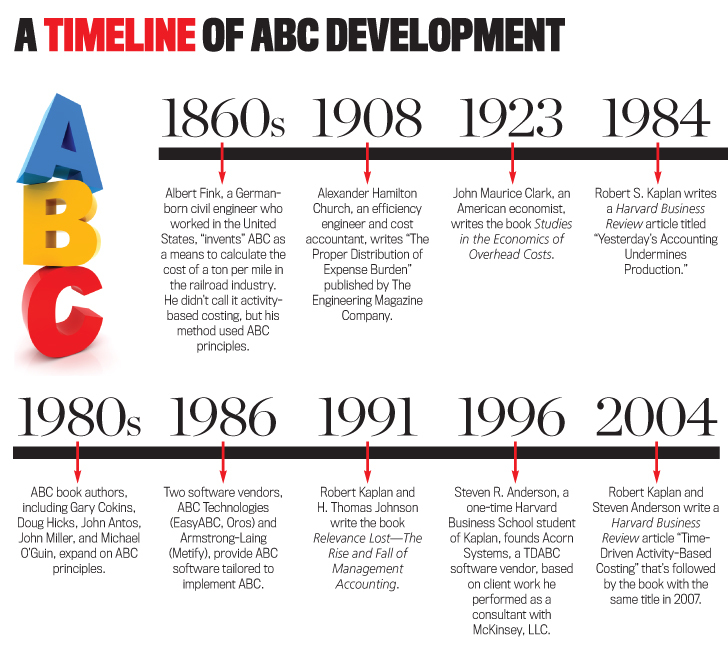 Understanding and needed buy-in from managers for applying ABC can be achieved. Going forward in time, the DRBABC model can also iteratively be disaggregated in only selected parts of the model where further granularity yields better or more accurate information. Once an organization matures and its informational needs become more sophisticated, it can choose to migrate to TDABC. 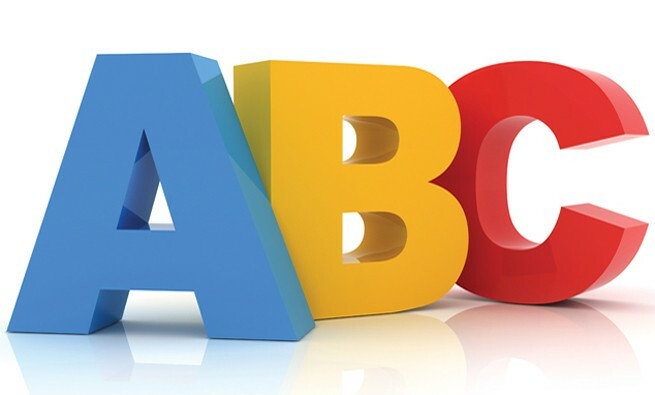 We believe that all organizations can benefit from an ABC cost assignment method and that either method discussed here is an improvement over what typically exists with flawed and misleading cost and profit margin information. For some organizations, starting with a DRBABC model with subsequent iterative remodeling can be a fast path toward results. Yet some organizations will, over time, potentially reach the crossover point. From there onward, TDABC offers increased benefits with regard to accuracy, model maintenance, and overcoming the capacity-insensitive nature of DRBABC. Gary Cokins, CPIM, is IMA’s executive-in-residence and is founder and owner of the consulting firm Analytics-Based Performance Management LLC in Cary, N.C. (www.garycokins.com). A thought leader in EPM, business analytics, and advanced cost management, he previously was a consultant with Deloitte, KPMG, Electronic Data Systems (EDS), and SAS. He also is a long-time member and active committee member of IMA. You can reach Gary at (919) 720-2718 or gcokins@garycokins.com. Douglas D. Paul is solutions and engagement manager for Ignite Technologies, formerly Acorn Systems, Inc. He has more than 25 years of experience in finance software, consulting in cost and performance management, and corporate positions in controllership and IT. You can reach Doug at ddpaulpm@yahoo.com. Excellent article and very well-explained. My only concern is the cost of complexity. 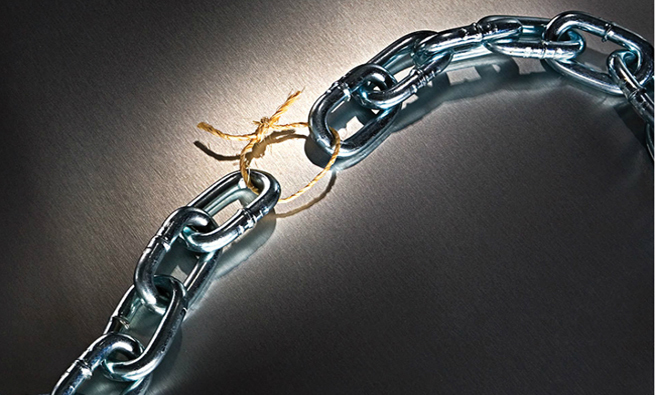 finance departments have suffered significant downsizing over the past ten years. We need to keep cost allocations simple while maintaining causality. Very useful for strategic decision making and setting service level agreements. Good article, but to make it easier to read, I would drop the abc from the abbreviation and call them Td and dr.